Recently I saw Sylvester Stallone posted the picture below from the set of Rocky 3. He describes how between scenes, he had to go to the corner and turn up-side-down to get blood back into his head. In order to look the way he did, his body fat was 2.9%, which made him light headed during scenes, and in order to continue, and not faint, this up-side-down trick was needed. Stallone goes on to say that while he looked in great shape, he was far from it. Transforming his body for Rocky 3 left him very unhealthy on the inside, despite outward appearances. I admire Stallones honesty. I’ve read similar things in the pages of Men’s Health magazine from today’s action heroes. Daniel Craig became a vegetarian for a time after James Bond because the diet needed to get his Bond-look was, in his opinion, disgustingly high in meat. Chris Hemsworth was eager for a run because his Thor training regime specified zero cardio work, at one point he stopped training when he outgrew the Thor costume. Henry Cavill says the Superman physique disappears very quickly after filming because it’s not designed to be sustainable. The action hero physiques you see in the movies are built on training regimes designed to make you look a certain way for the brief period that you are filming. They are driven by aesthetics, not health, and they are ephemeral, not sustainable. That’s not to take away from the effort that these guys put into attaining their physiques, the hard work is very real, but the results are primarily aesthetic in nature, and the schedules not conducive to even their own lives. Aesthetics are important for your mental health, we all like to look good, but don’t base your training goals on what you see in the movies. I work in an office from 9 to 5, so more realistic goals are required. How much fruit and veg? I recently read that the Japanese government gifts their citizens a silver sake cup when they reach 100 years of age, and that the policy is being reviewed because last year it cost the Japanese government $2 million. In Okinawa, Japan, you’ll find the world’s highest prevalence of proven centenarians. Not only do they have the highest life expectancy in the world, but also the highest health expectancy, they remain vigorous and healthy into old age. I’m sure there are many reasons for this longevity, and diet must be one. In Britain and Ireland we’re all familiar with the “five-a-day” maxim. The Japanese government recommends up to 13 portions of vegetables a day, plus four portions of fruit. A spokeswoman from the British Department of Health (I assume Ireland just copied these guys) said of the five-a-day campaign, “There must be a balance between what is healthy for the British public and what is feasible”. In other words, 5 was chosen because its a sufficiently low, unthreatening number. 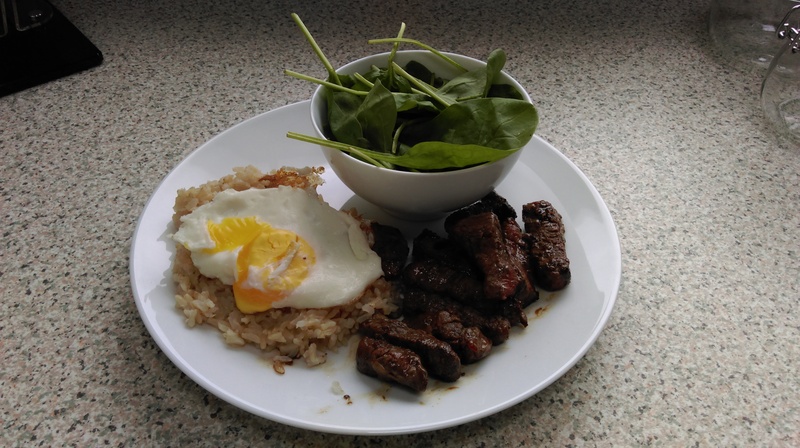 Below is my attempt at an Asian style meal: rice, egg, spinach, and steak. Delicious yes, but a very Western slant on Asian cuisine, with just one portion of veg. It doesn’t help that the variety of interesting fruit and vegetables that grow in Ireland is low. There are many ways in which eating fruits and vegetables is beneficial for health. Both are high in fibre, which makes you feel fuller for longer, which can help reduce unhealthy snacking. Fruit and vegetables are also a natural source of numerous vitamins and minerals that are essential for maintaining good all-round health. I eat a lot of fruit, but I’m not so good with vegetables (the better of the two). If I want to live to see the year 2086 and beyond, I’ll have to add more veg to my diet. More fruit and veg, good advice for all.